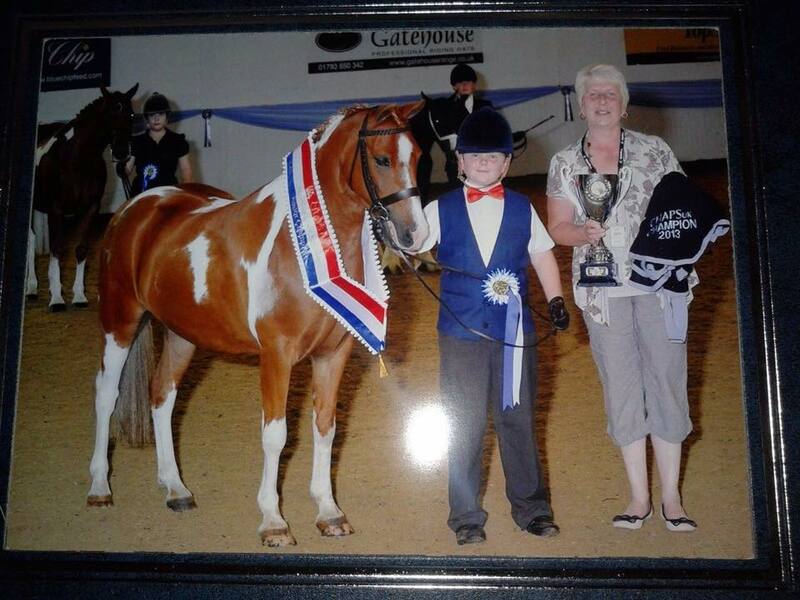 Team Benson – Brooke age 7 (jockey) Jake age 13 (handler), Sam (Mum) age ??? leader & groom and Paul (Dad) pays the bills! Our 2 ponies Country Prince (AKA Eddie) 9yo LR SHP and Llwynneath Illtyd (AKA Blaze) 5yo LR M&M Section A, have had a very successful 2014 season. 4th in his in-hand finals and 7th in his LR final. 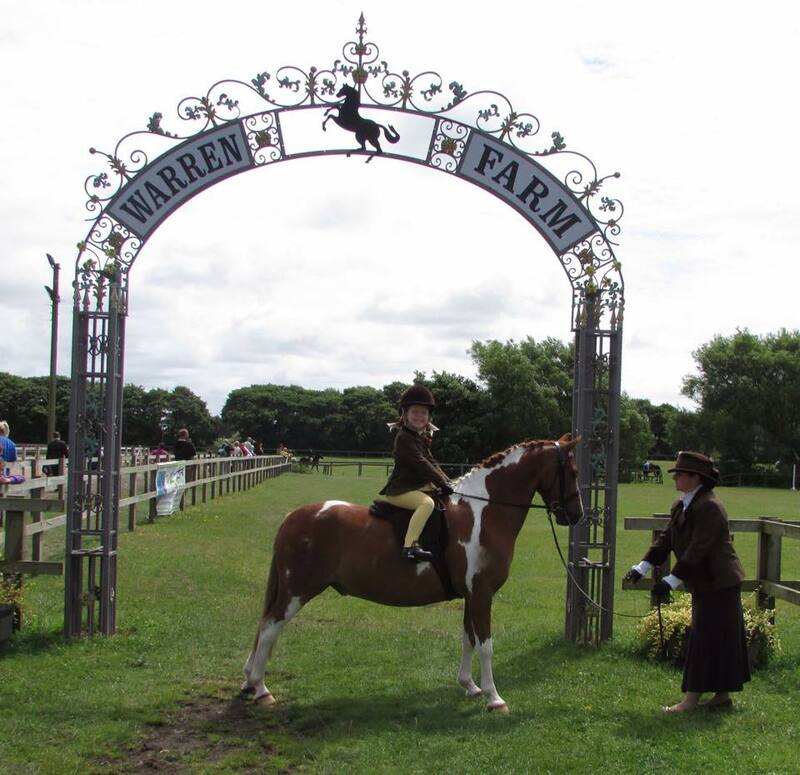 Brookes junior bursary prize money will soon be put to use,this money is being used for riding lessons with Sue- Helen Shuttleworth (Traditional Show Cobs)and will start after Easter. Both Eddie and Blaze had a few months break over the winter period ,work started again in February in preparation for the forthcoming season.Eddie is attending CHAPS Spring show on the 11 th April ,Brooke is hoping to retain her Mini Champion title,we will see ,spring is in the air and eddie is not on his behaviour currently. 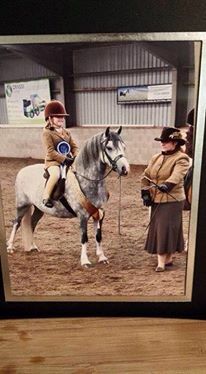 Blaze's season starts in May this year where he will be taking centre stage in preparartion for HOYs quals in 2016. Brooke will also be campaigning Concourse D'Elegance classes this year with Dad (Paul) leading .I'm looking forward to taking a back seat ,watch this space for results and pics. We have an action packed busy year ahead. A couple of CHAP's shows spring and North East. We will provide regular updates as to how we have done,wish us luck,again a massive Thank you to Sharon at Galloping Geldings who support us and provide our showing items. Brooke and Eddie did it again! Successully defended their 2014 Mini Championships at CHAPS Sring. 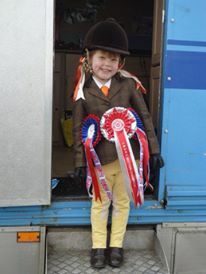 Both ponies have won so many rosettes and trophies for Jake and Brooke this year these are just some of their achievements, both ponies will soon be turned away for winter for a rest and will come back into work in early 2015 ready to start it all again, we hope to campaign Blaze on the HOYS circuit next year so watch this space! Brooke's lessons are continuing and she is now riding completely independant off the balance strap and has ridden Blaze on her own,with a slight unscheduled canter and buck! Brooke had her debut Concourse De Elegance on Blaze at F21 warren Farm and won,the class looked very elegant ,Brokkes dad was attendant to let mum watch for a change.We attended Supreme Showdown ,Blaze won 2nd in open LR and LR M&M but didn't get anything in the Championship but it was a good learning experience for him. June Westhoughton Show, Blaze won LR M&M and was ring Reserve Champion .Brooke was 3rd in a huge handler class,Eddie won the LR SHP and was ring resrve champ,didn't stay for the supreme as both boys were tired .July is here already and only a couple of shows in before a run going through august. Winter Break is well and truly over and show season is well underway. 2016 show team is Llwynneath ILLtyd-Blaze (section A LR M&M)and Coppinshill Couture -Annie (Dartmoor yearling). Blaze has gone to be produced by Team Moore for 2016 though Brooke is still riding we are aiming high this year . Season started at BSPS area 2b at Myerscough in March with Blaze gaining a 2nd in the open LR M&M-a great startto the season ,then NCPA Spring Show at Southview where he won the LR Novice M&M and took Novice Mini Champ .Onto April and NCPA Lancs was attended and Blaze was not the judges ''cup of tea''though still came away with a 3rd and 2nd. Start of May we went to BSPS area 2A, Blaze won his LR class and took mini champ which qualified him for both member supreme (as 2A is their area) and supreme championship, they went in a well-supported members supreme and was delighted to get reserve to her team mate Georgie Moore, then got reserve reserve in supreme. Onto end of May and BSPS Area 2b, they were a credible 3rd in the LR Heritage class, judge definitely liked her Dartmoor’s Blaze was the only welsh placed so all in all very pleased, next outing is their 1st HOYS qualifier wish them luck, as for me mum I’ll be a nervous wreck on the side-lines…………..
Midland Counties Brooke unfortunately dropped her outside rein which she was heavily penalised for resulting in no place, Cheshire County judge asked leader to halt and change lead side (leading from wrong side) which Blaze wasn’t happy about again resulting in no place. However not all doom and gloom J Annie our Dartmoor yearling made her 1st appearance of the year in at the deep end at Royal Cheshire, open Dartmoor youngstock and youngest in class too, pulled top and stayed top to win, then took overall Dartmoor reserve champion, she was superbly behaved for such a busy show. 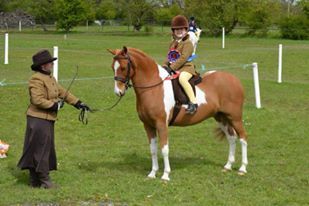 Been a quiet couple of months, Brooke decided she doesn’t like the HOYS quals as there are way too many ponies in the classes, teamed with no placing so decided to park them for this year. July took us down to the RI, both Blaze and Brooke rode their hearts out and completed the set show, 34 ponies forward and only 8 placings, unfortunately not one for us but she enjoyed the experience and we will definitely aim to qualify again in 2017. Nothing in August for Blaze but Annie went to Garstang Agricultural show and took 2nd in Youngstock small breeds M&M. Sept and NCPA POY Annie was entered in Dartmoor/Exmoor yougstock class, she took class champion this filly has such a great future in front of her, Blaze took 4th in open M&M LR and 2nd in Novice M&M LR. Annie is now turned away until 2017, 3 shows this year 2 x 1sts and a 2nd a reserve champ and a champ we are more than happy with that and don’t like to overshow babies. 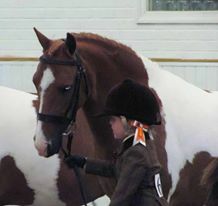 Blaze has a few shows remaining however we have made the very hard decision to offer him for sale, Brooke has had a “growth spurt” this year and standing at 11.2 the picture just isn’t right, so though we will remain competing him this year who knows what 2017 will bring for her, we will keep you updated with new and pics. This year has turned into a whirlwind we have so many updates. Royalview Dark Knight has been broken and has now been turmed away for the summer to mature and do some in hand which left Brooke without a show ride, after an ''emergency call out'' we were kindly offered to loan Isley Walton Pearl who has previously successfully competed HOY's & RI, though we got her later into the season Brooke only had 4 chances to qual the RIHS. Rutland 3rd , we had plenty of tears they tried their hardest and could nearly touch it but it was not meant to be,onto the HOY's though so far its not happening only 2 places a 9th at Derbyshire Festival and 6th at BSPS area 15.We are thoroughly deflated and have decided we don't enjoy chasing the HOY's and won't be trying again next year. Pearl will stay with us until after the BSPS then she will return home. Polly is an absolute saint and Brooke is really getting to grips with riding solo ( though still hates canter). 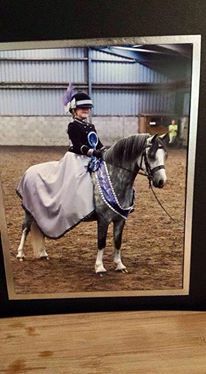 Brooke has attended a show with her and gained a 6th in the inhand PBW which was a huge class and a 2nd on bonny pony , she wasn't bought for shows but for confidence which she is doing. Annie is a field ornament this year , however entered for the Royal Lancs , she will be campaigned next year properly as a 3 year old.